There's no birthday party like a KickForce birthday party! 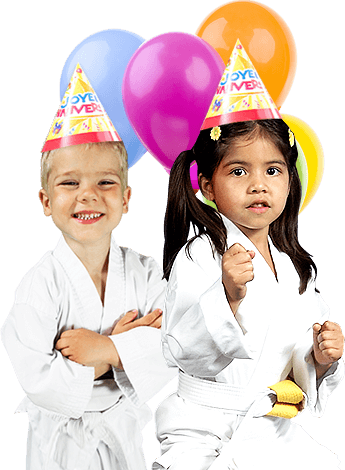 KickForce Martial Arts will help you create a memorable martial arts birthday party for your child, family and friends. Your guests will enjoy games that teach them courtesy and respect, while having fun! See our Birthday Party Packages for Mira Mesa below! Contact us for Clairemont information. You may provide decorations for us to set up, and food/drinks for parents. Please speak with an instructor to schedule your party today! Thanks to everyone at Kickforce for making my son's 5th birthday party such a blast for everyone. From the moment we arrived, the super-friendly staff (Carlos, Jaycee?, and Tara) took exceptional care of us, helping with all aspects of the setup, greeting arriving children, etc. Once the party started, Carlos the instructor, masterfully began the lesson for the kids. He made it so fun and engaging for them, every child was smiling, eyes glued on Carlos' every move. Tara, Jaycee, and some others provided exceptional service to us during pizza and cake time, cleaning up after, and even helping us load our car with presents - what a value! Will probably be remembered as one of the greatest birthday parties yet. Thanks again Kickforce, great operation, amazing job! !